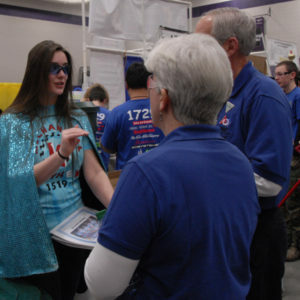 On February 26-28, forty teams competed at the Nashua South High School for the New England Granite State District Event. 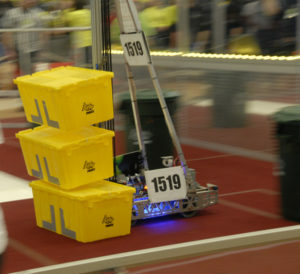 During practice matches on Thursday evening, the 1519 drive team exercised their operating abilities and tested “King Tote-n-Can-um’s” software and mechanics on a real field. After a day and a half of qualification matches, Mechanical Mayhem ranked 1st with an average qualification score of 90.41 points per match. During alliance selection, 1519 invited the Grasshoppers (95) from Lebanon, NH, and the Robosaints (1307) from Dover, NH, to join their team in the elimination rounds. composed of the Cardinals (811) from Nashua, NH; Entropy (138) from Amherst, NH; and Gompei and the H.E.R.D. (190) from Worcester, MA. 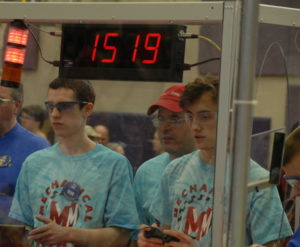 In addition to their gold medal finish, Team 1519 won the Innovation in Controls Award sponsored by Rockwell Automation. With only two weeks to go until Mayhem’s next tournament hosted at UMass Dartmouth, Mechanical Mayhem immediately reconvened to figure out its next steps in improving the team as a whole.